Since their 2009 debut album, Other Lives have been incredibly busy touring the nation with bigger acts and larger crowds. 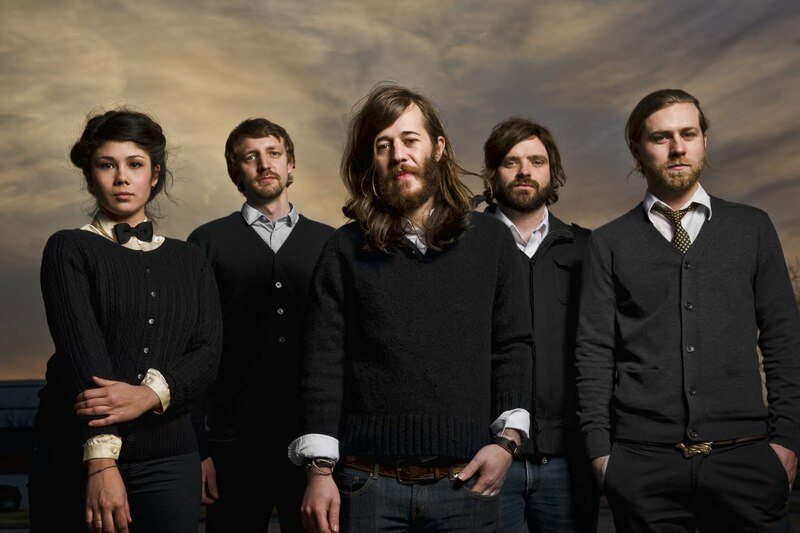 Most recently, the band blew away crowds while touring with indie-folk group, the Decemberists. On top of putting on a phenomenal show, full of mind blowing instrumentation, Other lives records have been received nothing but praise. Their latest release, "Tamer Animals," is chalk-full of songs that are both haunting and oddly catchy. I spoke briefly with front man, Jesse Tabish, about their current nationwide tour with the Rosebuds, new album and writing processes. 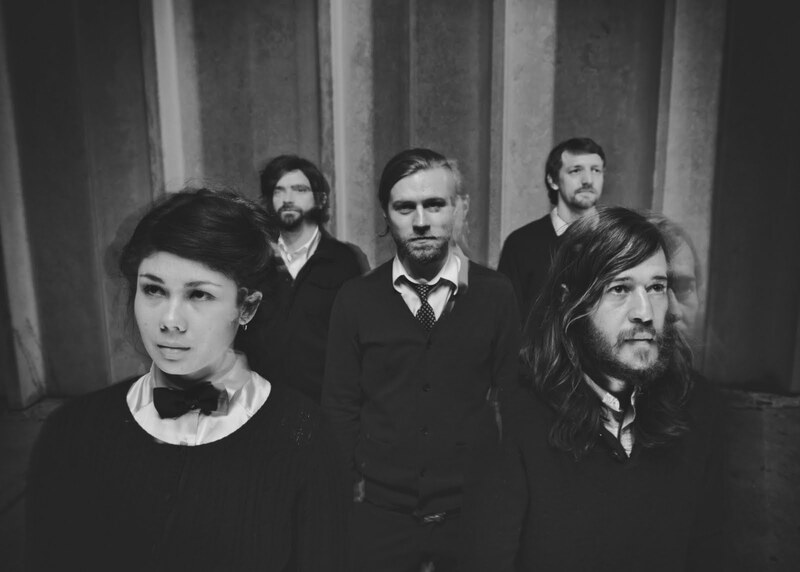 Check out http://otherlives.com/ for more information on the band and tour dates. How has the tour with the Rosebuds been thus far? Tabish: It's been fantastic. Actually, I am home right now, in Stillwater(Oklahoma), for like a day. We drove overnight from Houston to get a day of rest at home. I'm pretty happy right now(laughs). The Rosebuds are the best and we couldn't be happier, playing with them. The shows have been really good and the responses have been positive so far. What would you say people can expect when they come to see an Other Lives show? Tabish: Well, you can expect a lot of instruments onstage(laughs). From there it is up to their own judgement(laughs). They can expect that. Other than that I don't know. Hopefully a good time, but who knows, right(laughs)? How did the writing process pan out for you on your latest record, "Tamer Animals?" You wrote most of the record, correct? Tabish: Yeah, I wrote a lot of ideas on our first tour in 2009. That was the first time that I had written on a computer with an orchestral program. It kind of opened my mind to arrangement, which before I was primarily working with guitar, piano and cello. So, it kind of opened my mind to different possibilities in recording. We got back, and basically we would start a song at a time. In the morning I would go in and write for two to four hours and then in the evening we would work on the current song that we were working on. It is also different because we didn't do any of the songs as a band. I had written a lot of the arrangements. So we went in and really crafted it piece by piece, note by note. It was basically a combination of that, and also self-recording and self-producing on the otherwise. Which was kind of a whole other task of getting the right tones, getting the right instrumentation and editing. All of the kinds of things that other people do when you are in a studio, we were doing the same stuff ourselves. What we enjoyed so much about it, was that it was all in our control. Editing and producing became just as important as writing and getting the tones. They all kind of just came together. Is it something that you would do again on a future release? Tabish: I definitely plan on it. I don't know what will happen in another year, but that's definitely in the plans. You mentioned that you wrote a good bit of it on the road? Is that pretty standard for you, or were you forced to due to time constraints? Tabish: Yeah, it definitely is. Especially being gone for long periods of time. It definitely keeps me in the right place mentally, and it is something that I keep up with for sure. I have heard songwriters state that "writing" is like a muscle in your brain that you need to exercise, to make stronger. Would you agree? Tabish: Very much so. For me, it is a daily practice. I don't necessarily work in the mind set of, or for a record. It is purely for that day. Of course we will work on an idea, and then a week later I may work on the same idea. There are so many variables or aspects (in a song) to work on. Anything from the initial idea, to arranging or it could even just be a sound. Specifically, how did the song "For 12" originally come together? Tabish: My sister wrote a film, and she asked me to do some music for it. So I wrote a bit to it, and I really liked it. I had a verse, with a galloping guitar and some vocals. It was one of those nice things that accidentally worked together. I ended up putting this big string thing over this galloping guitar and it happened to work out quite nice. And that's kind of how it came together. What about the music video for "For 12?" How did that come together? Tabish: A director approached us with this idea, and we sat down with him and we really just fell in love with the idea. It was kind of more about creating a mood , than telling a story. It was kind of his decision and we went along with it. I was really happy with how it turned out. As a band that has been together for over eight years now, what kind of advice would you give to a band just starting off? Tabish: I would say don't be too quick to go on the road. Don't be too quick to put out an album. Work on writing first,and that will sustain the band. The rest of it is simple math, touring and getting along and all of that stuff. That's basic stuff. Just write everyday and work at your craft. Don't be too eager(laughs). Perfect day, driving in your car, windows down what are you listening to? Tabish: I would say "18 Musicians" by Steve Reich." by Steve Reich. Who are some artists/bands that you have looked up to in the past regarding stage presence/live performance?A few of us come from punk rock backgrounds, so growing up, stage presence was all about energy and movement. Band’s like MxPx, Hot Water Music and The Bouncing Souls always put on great shows. I think if you asked Nick (vocals/guitar), he’d say something more like Guster/Counting Crows and if you asked Matt C (vocals/keyboards) he’d say Radiohead. I think the bottom line is if you captivate your audience, we look up to you. For people that haven't seen your live performance before, what can they expect when they come to one of your shows? We’re goofy. That’s kind of the way we act on stage. The only thing we love more than playing each other’s songs is playing them for an audience full of drunken friends and fans. So any time we can have fun on stage while interacting with people in the crowd we do. There’s always a fair amount of poking fun at each other, too. At the end of the day, we just don’t like to take ourselves too seriously. We know a lot of bands that go kind of crazy with lights and equipment, but we kind of like to just keep it really straightforward- play our songs and have plenty of quality banter with the audience. "Falling" is a beautiful album, would you consider it to be a conceptional record? Thanks for the compliment! That’s a tough question. So many bands call something a “concept” album when the album just has a coherent theme, when in reality, a concept album (to me) tells a narrative. Our LP is really just a cohesive album with a central theme. Falling was the culmination of a lot of writing and band lineup changes. We introduced Matt C to the band early last year, and one of the biggest challenges was fitting his songs into JBS, which had already established a style of its own. I think at the end of the day, Falling came together with more of an emotional theme. The idea of “Falling” isn’t negative. It’s an ironic perspective that if you fall (i.e. take risks, put it all out there, make mistakes), something great will come of it. The title track refers more to relationship-based themes, whereas “All Away”, refers more generally to knowing that big things lie ahead. Our bio puts this theme a bit more eloquently, but you get the idea. How has the reception of the album been thus far? Great! We did a very small pressing and have been relying more on digital sales. We actually had to do a second pressing because we ran out. I think the key here is word-of-mouth. We’re still a really young band, and it’s been awesome to see how many people have picked up the album (or just the single), because their friends did. It’s also refreshing that we’ve received some reviews that have pointed out the fact that they liked our ability to merge the three songwriters into one cohesive sound. We’ve been really pleased. What would you like for people to take away from listening to "Falling?" I think I alluded to this a bit in your previous questions, but the whole point is that life is about risks. Whether you’re getting into a new relationship, starting a new job or moving across the country, you have to go for it. As people, one of the worst things you can do is avoid an opportunity because you’re afraid of it. JBS has had had to deal with a lot of adversity (both in personal lives and as a band), with changing lineups and trying to fight through the “noise” in these New England music scenes, but we’re really excited with the music we’ve written and the goals we’ve reached. We could never have done that without the risk of failure. So, we wanted to get that into the album, and I think it comes across pretty well. Any recording/album plans in the near future? Because it took us so long to finish Falling we’re torn between letting it go forward with the current momentum, or working on a new release with all the material we’ve written during promotion. I’d like to think we’ll start planning for a shorter EP later this year, maybe for release in early 2012? But that’s really up in there air. What I can say is that the next release will be a much more collaborative effort, and you’ll hear a truly cohesive JBS sound. How does the writing process normally pan out for you? Several of you are avid songwriters, correct? That’s right, we have 3 writers in the group, Nick, Matt C and me. We all write differently. Matt and I are both classically-trained composers so we tend to write with those concepts in mind. Matt is truly a “chordsmith”, and always starts with awesome progressions. I usually start with an instrumental hook (usually a cool acoustic guitar part or something) and build around that, while Nick is very narrative. He usually writes words and melodies, and builds chords around that. As a band it’s more on a case-by-case basis. We’ll usually send each other demos, talk about them, and come up with the song’s form before we settle on actually parts. It makes for a really productive arrangement process. We arranged “Call Me Crazy”, “The Fire Escape” and “You’re Still My Love” during one rehearsal in under half an hour. We’re proud of that. Do you write continuously? Or are you more periodic writers? A little of both. I think Matt C and Nick write constantly. For me, it comes more in waves (based almost solely on all the other stuff going on in my life). I usually write songs to relax. So, if I have a lot of time to relax, I write a lot of songs. Are there any artists/bands that you are really into right now? Death Cab, for sure. I think that’s the one band that all of us truly agree on. They are one of our influences and we look up to their songwriting and production a lot. It doesn’t hurt that they just released a new album (which is great by the way, particularly the last 5 or 6 songs).Other than that, I’m on a huge folk kick lately. Sigh No More by Mumford & Sons is a great album. I’m also really into Joe Pug and The Tallest Man on Earth. How important is social networking for artists like yourself? I think it’s important for everyone (businesses and artists alike). Twitter in particular has been a huge success for me on the publicity front. I’ve connected with a lot of people on there and actually found a lot of blogs and websites that are now my go-to’s. It’s great for interacting with new fans. I think Twitter has found a way to bridge the gap between artists/actors/celebrities and their fans. It really helps make a connection. Driving in you car on a perfect day with the windows down, what are you listening to? I can only really speak for me. Lately it’s been Death Cab For Cutie and Mute Math. They are really great bands for driving around. Of course, if I had to choose a type of music I always go for on a summer day, it’s Ska. One of my top 3 favorite albums is Hell Rockview by Less Than Jake. I know it’s a little “High School” of me, but I love all those bands. There’s just something about that energy that makes my drive just that much better. Any local tour dates coming up in the near future? With the debut of his 2008 release “Holly “ featuring the very popular tune “After Tonight,” Justin Nozuka quickly became a household name. His follow-up album, “You I Wind Land and Sea,” further cemented the singer/songwriter’s international success. Shortly before boarding a plane bound for Paris, I had a chance to briefly speak with Justin about his latest accomplishments, world travel and latest release “The Blue Velvet Sea EP”. Over the past several years, your music has definitely taken you around the world. Have you always had aspirations of becoming a world-traveler? Nozuka: It was an abstract idea for me in the beginning. I didn’t know where it was going to take me, but I knew that I wanted to go and play for lots of people. I always had that image in my mind. I had no idea what the touring experience was like, and how it was going to unfold, but I knew that I wanted to tour. Then it just started happening slowly started happening. Do you enjoy the aspect of traveling around the world? Nozuka: Yeah, it can be a trip sometimes. It’s nice to have some perspective, when you are just touring, touring, touring, it becomes kind of a crazy experience. But, when I have time off and live my life at home, and then I get back to the airport and I am back with my whole family again. My brother, my band, my tour manager and sound guy get to re-unite, it’s kind of an uplifting feeling to be rolling with such a crew and so much gear from country to country. It feels good. Where are some of your favorite places to travel world-wide? Nozuka: I really like Western Europe, where we re going and I really like America as well. I love traveling through Canada. All of these places are special and they are all different in the way that human beings have established, but they all have some similarities also. It is really cool to see all of these different cultures. To be there for two days, get a sneak peek, make some friends, then leave to go to a different place. What do you think makes your music so appealing to so many different cultures? Nozuka: I think that if music is done properly, which I’m not saying I have done, but I strive to do that. I think that ultimately, when you create music that is proper music, then it becomes fundamental and anyone can relate to it or connect to it. When done properly, the language doesn’t really have anything to do with it. It’s actually the music as a whole. When it is speaking truth, everyone can relate to that on a fundamental level. What kind of advice would you have to a musician who is just starting off, and also has aspirations of traveling with their music? Nozuka: I would say that it is important to have it in your mind, what your attention is and what you want to do. Really just go for it, and fall and go for it again, and learn and continue to go for it. First, it starts as an abstract idea and you have this dream and desire. It will take you to one place, and in that time you act in a certain way and you do what you have to do in that one place to get you to the next place. It is constantly building into this idea that you have. As you get deeper and deeper into it, you realize that “the idea that I originally had, doesn’t really apply to reality or the way that my situation is right now. I have to adapt it at this point.” Have an idea of where you want to go, and what your ultimate dream is and just continue to envision it everyday. Continue to envision the dream and I think that will take someone to big places, you know? It looks like you definitely have a big heart for Africa. Where did that begin? Nozuka: Well, that experience came through a friend that I met in Paris actually. She came to me with the opportunity to go to Africa, because she was already involved through a few friends at the Children of the Wilderness foundation. She asked me if I wanted to go, and I pending on it for a really long time. Then I realized that I really should go and check it out. So I went there and really learned about what they were doing, and understood more about what the situation is. I really believe that I want to get into more things, especially focus on some of the issues that are happening here at home, in Toronto and places that are close to home. There is a lot that is happening and a lot that should be happening, so tat is where my heart is. I really want to continue to get involved. It is a beautiful thing, that we are able to get involved in places all over the world. As much as we think that it is important to just focus at home, by focusing on other places in the world we really do take steps towards creating a more peaceful structure. It is all something that we can enjoy. Africa is a very special place, the people are very special there. There is a lot of love, and a lot warmth and a lot of light that is there. I think that if we aren’t careful with places like Africa, in terms of the way that we set up our way of living, which now I think that most of the world operates on. If we don’t focus on these steps right now, we could possibly wipe out full nations, cultures and species as as we have in the past. How did the idea for the Blue Velvet Sea EP come together? Nozuka: The EP was really kind of another piece. We did some stuff in a cottage session, we did some live peformances in the countryside, my band and I. We had these recordings when the second album(You I Wind Land and Sea) was released, and I just really wanted to put something else out. So, we put this together quickly. There’s songs from 2006 and stuff from along the way that I really wanted to put out. Are you actively writing right now? Nozuka: Yeah, I’m writing and working on the next album right now. I’m working on some new music, and I am really just zoning in on new music and getting in the flow. What are some of your influences right now? Nozuka: Bob Marley, Dave Matthews Band and Red Hot Chili Peppers. I think that those are the main ones. Are you seeing your writing process unfolding differently than it normally does? Nozuka: Yeah, I see it happening more naturally. Just to relax into it and capture all of the good stuff in a calm and connected fashion. Are you normally a co-writing kind of guy? Nozuka: Yeah, I have been involved with some co-writing lately and working with some different cats. Learning some people’s different vibes and enjoying their different vibes. I am open to it now, and I used to be really closed off to it. On the EP I saw that you had a new version of “Heartless,” featuring India Arie. How did that come about? Nozuka: We did a performance on Letterman a year ago, and India Arie saw it and tweeted about it. We reached out to her and she said that she would help, and get involved and she did. Perfect day, windows down driving in your car, what are you listening to? Nozuka: I am listening to the Red Hot Chili Peppers. 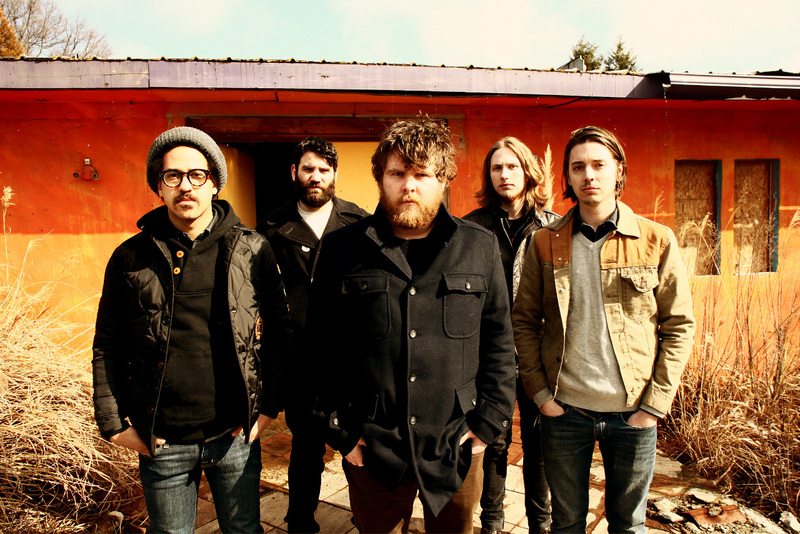 Increasingly gaining popularity, the alt-rock outfit Manchester Orchestra released their third full-length record, “Simple Math” to rave reviews and well deserved praise. The follow-up to the band’s groundbreaking 2009 release, “Mean Everything to Nothing,” aims to push the boundaries of their sound. A collection of diverse tracks that bring in new elements and instrumentation, “Simple Math” is sure to capture the ears of new listeners, while keeping the devout fans content. We had a chance to speak with Chris Freeman and get his thoughts on the new record, before their sold-out hometown show in Atlanta. How's the tour been thus far? Freeman: It has been awesome man. We love Cage and we love O'Brother. We have had a really good time just hanging out with some of our best friends on tour. You have the big hometown show tonight, right? Did it sell out? Freeman: Yes, why yes it did. We sold out about a week ago, which was a really big surprise and we are really stoked. We have been to the Tabernacle a million times to watch other people, and we always wanted to play it. It's like the Fox (Theatre) for us. It’s this big beautiful room that we are really, really excited to play. How does it feel to be playing the bigger venues now? Freeman: It feels great. It feels nice. The cool thing about it is that we have our own monitor now that we are sharing with Cage. I think that is a big part of being comfortable onstage every night. You walk out there and sounds exactly like the night before. It is great, and fun to have a good amount of people there every night screaming and singing along to the songs. With your latest release "Simple Math," did you guys have a goal in mind before you started making the record? Freeman: Yeah, the thing that we always have is to make something far better than what we've done before. I think that we knew with these songs, we had something that we were really going to be proud of at the end of it. I think it definitely came out exactly the way that we wanted it to come out. We definitely had somewhat of a goal when we walked in. Where did you guys come up with some of the ideas for the record, in terms of the musical content? I noticed that you guys had a lot of orchestral arrangements on this record, as well as little things like a kid's choir on one of the tracks. Freeman: Well, it went along as it did. All of the songs were written without any kind of orchestration, or children's choirs or anything like that. All of that kind of stuff was added afterwards, where someone was like "Oh, maybe we should do a kids' choir there!" So we tried it and it worked, so we kept it(laughs). A good friend of ours, Ben, did all of the string arrangements and that was pretty much it. We kind of trusted him with the songs, and handed them over to him and he made a whole orchestration and it sounded beautiful so we kept it (laughs). What are you looking for listeners to take away from "Simple Math," as a whole? Freeman: Hopefully some sort of experience through the whole thing. I think that it’s an "album" for sure. The songs definitely stand on their own, but as a whole they are a lot stronger. If you look at it from the beginning to end, it’s like an experience. Did you plan on it being a conceptual album, or is that just how it came together? Freeman: Yeah, it definitely is. There is definitely a storyline in there. That's kind of why we see it as sort of an experience album, from the perspective of Andy dealing with marriage and God. Those first couple years of marriage are a very difficult time. Once we realized that we had a conceptual storyline in the songs that we were going to end up putting on the album, it started coming together in that way. We noticed that lyrically, it was more cohesive. We had a lot of songs on this record and we ended up not using a lot of them, because these songs seemed to fit together really well. Then we noticed that there was a cohesiveness through all of them, as we were putting them together. It wasn't musically, but it was lyrically and thematically. Do you think the songs that didn't make the record will eventually see the light of day? Freeman: Yeah, we've talked about it a couple of times. Our band really does like going in the studio, so once we get some time off perhaps we can go in and "re-hash" some of those old songs. We definitely go back to old songs in the writing process, since we have so many. So yeah, hopefully we can do something with those songs. Maybe make a b-sides album or something. I've read that you are kind of the multi-instrumentalist in the group. Were there any instruments that you were excited to use on this album, that you hadn't used in previous works? Freeman: A vibraphone, actually. At Blackbird Studios they have an insane list of instruments that you are able to use. I knew that they had a vibraphone there, and weren't able to use it on ""Mean Everything To Nothing(previous LP)." So once we got in the studio, we were able to mess around with the vibraphone. I think that it is a very pretty instrument and also a very creepy one. So we were very stoked that we could use it on the record(laughs). And we used it a couple of time, so that was very sick! I know that naming your favorite song off of a record, is like naming your favorite child. But what song were you most proud of(laughs)? Freeman: Personally, I really like "Pale Black Eye." I think that the keyboard parts on that song were more difficult than most, for me, because its not really a separate part. It pretty much follows the chord changes with the guitars, which is unlike anything that I have ever done on any of the other records. Usually my parts are like a different part to go on top, but I think that took actual piano playing talent. So it took me a while to get it, so once I actually got it, and it sounded good, I was very happy. So how did most of the writing pan out? Did most of the songs derive from a riff, or idea Andy brought in? Freeman: Yeah. It varies from song to song, but he is definitely the core to every song we write. He either brings in a riff, or a full idea, or a full-fledged song and we just sort of go from there. After playing together for as long as we have, we can kind of read each other really well and know where the other person really wants to go with the song. So it’s very natural for us to write together. It fits really nice. You mentioned that you guys have been together so long, what would you attribute that to? There doesn't seem to be a lot of drama within the band. Freeman: We have just been friends for a really long time. There definitely is drama, but we have a policy of not going to bed with any "bad blood." We usually fix whatever the problem is, that night. So that's what I would attribute that to. We all like hanging out together too; we know what gets on other people's nerves. Once you know someone for eight or ten years, you start to realize that. If I am annoyed, or someone else is annoyed, we will just go off by ourselves for a little while or take a walk. We just treat it like a family. What kind of advice would you have for bands that are now starting up? Freeman: My only advice is to go and tour. That is a lot of bands' downfall. They don't get out of their own city and they keep playing the same bar. Yeah, just try and book some shows out of state, and try to get some momentum going and that's pretty much all you can do, except for making smart choices(laughs). Who all, in the band, is involved with Favorite Gentelmen Records? Freeman: Well, we are all part of it. Andy and our old drummer Jerimiah are the spearheads of that whole project and the company. Any new releases from Favorite Gentelmen coming out soon? Freeman: O'Brother has a new record coming out soon. Andy and Rob have just finished recording with those guys, and they are getting mixes everyday. We are kind of hearing them as we get them, and it sounds awesome. It will be a great release for sure. Will Bad Books(Manchester Orchestra plus Kevin Devine) come out with another release? Freeman: Oh yeah, we definitely have talked about doing another Bad Books album. It was such a fun process, and playing those shows together was so fun. Being able to go to L.A. and New York and play a couple of shows with Kevin is so different. It is really fun to put on a different hat for the day, you know? Being around him(Kevin), I will do anything Kevin wants to do because hanging out with him is one of my favorite things in the world. That’s kind of how that whole thing came together, because we all like hanging out with each other. Any updates on side-projects within the band? Freeman: Yeah, Robert has Gobotron. I have one, but I haven’t really done anything with it yet. It’s called Alaska Him Nicely, but it’s kind of a baby project that I’m trying to do. We are just kind of focusing on Manchester, and seeing what we can do with that. Also, it’s kind of difficult for us to write on tour, so once we get some time off we are all going to try to do some solo stuff for sure. Alot of bands looked up to you guys now, listing Manchester as one of their biggest influences. Is that kind of a surreal thing to hear? Freeman: It’s a funny thing. Its not like they look up to us, but it is cool running into people and them knowing who you are. Like bands that I know, that would know us. It’s weird shaking hands and saying “Oh, I play in Manchester,” and them being like “Oh yeah! Love the new record!” It’s sort of a cool, random run-in. Do you ever turn on the radio, or hear a band that you feel has a “Manchester” sound? Perfect day windows down, driving in your car, what are you listening to? How was the tour you guys just finished up? Barakat: The tour was great. We ended it about a week and a half ago. We did a month in Europe, with Yellowcard, and then we came back and did two months with them in the States. When do you guys guys back out again? Barakat: We doing like a month of promo and press, around the U.S. and England for the record release. We are going to do a month in Europe, this Summer, for festivals. Then we are going to come back and do a tour in the States with Mayday Parade, The Starting Line and Cartel. You guys seem to be playing bigger venues now, in the States. Is it interesting jumping to bigger venues? Barakat: Yeah, I mean it has been a really long process. It has definitely been a super slow build over the past six years of touring, where we have been slowly, slowly stepped into bigger venues on every tour. Now we are starting to make the big jump. It's definitely not the kind of thing, where we are like an overnight sensation band, where we can all of the sudden play big arenas. We are definitely starting to add some bigger shows into the bigger cities. So it's pretty cool! For people that haven't seen All Time Low live, what can they expect when they come out to one of your shows? Barakat: I like to think of ourselves as a live band. As much as we enjoy our records, and as much hard work that we put into them. It's kind of hard to show off our energy via our records, but I think if you come and see us live then it will really start to make sense and it clicks. I think that that's our natural habitat. Who are some bands/artists that you have looked up to in the past regarding stage presence and live performance? Barakat: As a kid I grew up idolizing Tom Delonge (Blink 182) as a guitarist. I just loved the way that he had the careless attitude onstage, and he had this punk swagger that I guess you can only get from growing up in southern California (laughs). I idolized his moves. Billie Joe Armstrong is another great front man, who can captivate an entire audience while singing and playing the guitar at the same time. He is also another idol of mine. Your latest album "Dirty Work" is coming out late this month (June 21st), but was slated to release much earlier this year. Do you think that pushing it back to the summer was a good thing? Barakat: Yeah, we tried to do a lot of recording between the recording process so that we weren’t just sitting around for like six months at a time.But it was definitely a good thing to go away for a bit and kind of take a break from touring, and let kids kind of build up a little excitement for our new music and new tours and everything. I think that it made it almost like a comeback, like we came back with a bang. So, I mean I think that it was a really good idea to kind of step away for a little bit. Have you guys been playing the new material at live shows lately? Or are you going to debut the live versions, when the album drops? Barakat: We played two songs live, on the the last tour that we did. “Time Bomb,” which is the “leak track” that we leaked a couple of months back, to show kids that we are still here. During the earlier part of the last tor, we started playing the new single, “I Feel Like Dancing,” which every night kind of went over better and better. Now it has become a staple in our set? 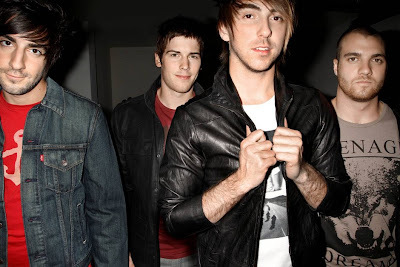 Who were some of the people you worked with on Dirty Work and why did you choose them to work with?Barakat: Well, Alex and I wrote “I Feel Like Dancing” with Rivers Cuomo. We actually went to his house in Santa Monica, we sat in his living room and it was just us three. They(Rivers and Alex) wrote the song, and I had a couple words of input. It was actually a really cool experience, to just sit there and write a song with one of our biggest inspirations of all time. It was really cool to work with Butch Walker again, on this record. We got a new producer on this record, Mike Green, who ended up doing a majority of the record. It was the first time that we’ve worked with him, and it really clicked. He has kind of become the fifth member of the band in a way. What were some things you guys tried to approach differently in the making of this record? Did you guys sit down and decide on a direction before the writing/recording? Barakat: Not entirely. I think that the major difference in the recording process of this record was we definitely weren’t scared to write a very poppy song or a very rock oriented record. 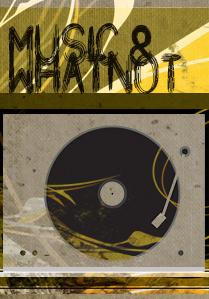 Whereas, on the last record if a song was “too pop” or “too rock” we would try to bring it back and even it out. On this record, we definitely have a good mix of very pop-driven songs and also some really rock-heavy songs that we really haven’t done before. Every song seems to have its own identity, and we did some really different things on the record that I think everyone will enjoy. You guys have an extremely strong fan base, that you have spent years building it up. What kind of advice would you have to a smaller band that is just now starting off? Barakat: One of the biggest things is to always think positive, and fighting through all of the stuff tht you have to. We started our band in 2003 and the amount of stuff that we had to go through to get where we are today, it was a really long road. It has been eight years. One thing that you have to do is be super patient, and work really hard. Definitely be wiling to give your entire life to it, because that’s what it takes. Something that I have always noticed about you guys as a band is that you are constantly out there doing interviews, interviews with fans, and you all tweet constantly. Do you think that those things were the biggest contributing factors in building up your strong fan base? Barakat: Yeah, completely! I consider us to be one of the first Internet-based bands, especially because we basically started our entire band via the Internet. Before MySpace Music even existed, we had a band MySpace page. We were one of the first fifty bands on PureVolume(.com), and we really built everything from the Internet. That’s how we started talking to record labels, that’s how we booked our first tours. Without the Internet social networking, like Twitter, we definitely wouldn’t be where we are today. It is a huge part of the band. When the album drops, what are the immediate plans? Touring right after? Barakat: The next couple of weeks building up to the record release we are dong a lot of in-stores on the East coast and the West coast, just to meet all of the kids and tell everyone that we have a new record out and get kids stoked. Then we are going to do a month of European Festivals with bands like Foo Fighters, My Chemical Romance and I think that the Black Eyed Peas are doing some and Blink was supposed to be on them, but they had to cancel. I know you guys are pretty huge in the U.K., are the crowds different over there? Barakat: From a show standpoint, the same kids are always excited to see shows and they all go crazy. From an excitement standpoint, it is interesting. You really get treated like royalty in other countries, because they don’t get bands really as often and they really make a point to treat you like the Beatles. They treat everyone like the Beatles, which is kind of weird(laughs). Not saying that the American fans don’t do that, but it is just a little more intense over there because they kind of want to thank you so much for traveling over to their country. It is definitely not like going to play a show in Ohio, it is miles of traveling and everything. They are definitely very appreciative. Where is the most “intense” place that you have played, where you were blown away by the reaction of the people? Barakat: I think that award would have to go to Brazil, because those kids are insane. It’s truly a remarkable thing to go down to South America, because they really freak out. They make it a thing to sleep in your hotel lobby(laughs) and wait for you, which is awesome and it shows like dedication. They really like rock music, and they are super appreciative when bands make it down there! Barakat: I would have to go with “Take Off Your Pants and Jacket” by Blink 182 and probably Reckless Abandon. With summer in full swing, one of my favorite groups to play on a perfect sunny day(or a day when you need a pick-me-up), is fun.. The super group comprised of front man Nate Ruess former lead vocalist of The Format, Andrew Dost, previously in Anthallo, and Jack Antonoff, current vocalist/guitarist of American indie rock band, Steel Train. It has been nearly two years since their debut LP, Aim and Ignite, introduced their energetic sound filled with infectious melodies, fun-loving lyrics and epic Queen-like harmonies. They are currently touring the nation with Panic At the Disco, are are planning to drop their sophomore LP later this summer on Fueled By Ramen. I had chance to briefly speak with fun. front man, Nate Ruess, about their upcoming album, live performance and his unique style of writing. What can people expect when they come to a FUN. show? Ruess: I have always said that it is a whirling dervish of sound. On stage we really like to have a good time, which is cool because our band name is FUN(laughs). I love playing live, and everyone in the bands is have a great time, so hopefully that comes across. I think the songs sound good (live), at least I think they do. I think for people that have seen us(in the past), our live show will change a little bit too, which is exciting for me. What is the set-up of the show, member wise? Is it just you main three guys onstage? Ruess: There are six of us onstage. With such intricately orchestrated songs, do you ever run into any challenges with bringing some of your songs to the stage? Ruess: I think it can be hard. We have any string players, and there are a lot of strings on the album and sometimes there are more vocals (on the album), than there are people singing. But I think that we make up for it in other ways. We make for it with a certain energy, and there is a little bit more of a rawness to the songs. They are different from the studio work, but they lend themselves to the live show very well. We try and duplicate as much as possible with who we are and what we have. We don't through on any CD's of ourselves and play over something. I think it works out really well. With all of you guys being from different backgrounds and different successful bands(the Format, Steel Train and Anathallo), how did you guys get together and decide to do this project a couple of years back? 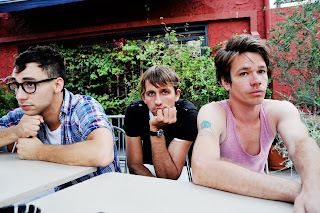 Ruess: When my last band was no more, I just knew that I wanted to work with those two (Andrew and Jack) specifically. They were the first and only two people that I called. I had toured with them in the past and had such a great friendship with them, and I admired them as musicians and as songwriters. So I figured if I was going to go down, I was going to go down in a blaze of glory(laughs), and would go with me. How did Aim and Ignite come together, from the writing standpoint? Were they songs that you had written, or was it a collaborative effort? Ruess: I had about forty or fifty percent of the songs raring to go, and then we worked out the other ones after the fact. But even when I had songs raring to go, that still means that there is a huge process. It took us about three and a half months to record the album. I hear that you have an interesting writing process? Ruess: Yeah! I don't know how to play an instrument because I'm lazy, so I just write everything in my head and try my best to explain it to either on of those guys(Jack and Andrew). Usually it varies on whether or not it starts on a guitar or piano, and then they will help me work through it and get my idea across. Hopefully at that point the song kind of belongs to all of us. So many times they just come up with ideas that I never would have thought of, that are so much better than the ones that I had. Are you guys finished up with the new album? Any recording left in the project? 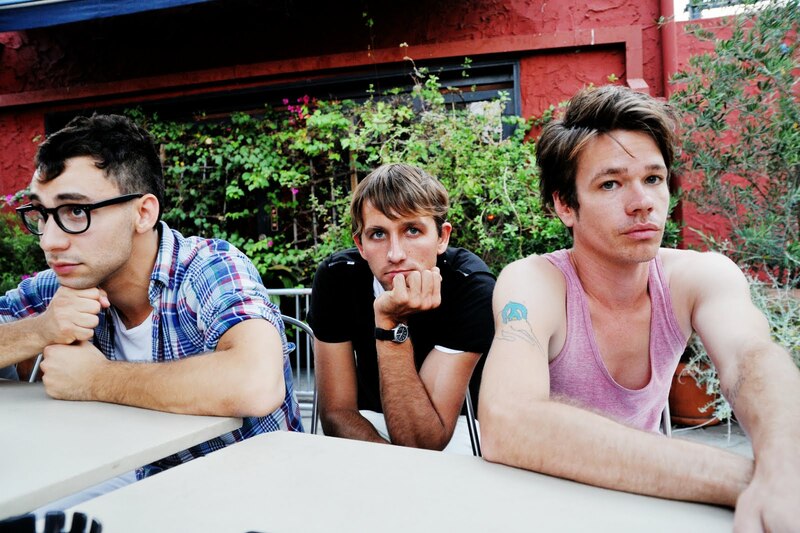 Ruess: We are putting finishing touches on the album right now. I actually have to go into the studio right in a couple of hours. We are working until the day that we have to leave for tour. We should hopefully be done, and be able to have to album mixed by then. Do you know about when the album is going to come out? Ruess: I think we are hoping for the late summer, I think that it should be the case. What are some of the differences that you are seeing with this album, in comparison to "Aim and Ignite?" Ruess: I think that it is so different. It is different in the songwriting process, to the recording process, tot eh instruments (used), to the style of songs. It still feels like a FUN album to me, because it's still my voice and lyrics, it's still Jack's guitar style and Andrew's piano and composition style. It's amazing that I think we have taken them(the songs) to a different world, and I don't think that we could be more ecstactic about it. I know that I'm supposed to say that, but I am secretly freaking out about how excited I am about the music. What about similarities? Are there still a bunch of string arrangements and harmonies that were prevalent on the first Fun record? Ruess: I think that it would be hard for us to not add strings or harmonies, but they are not a point of emphasis like they were on the last album. They are there for sure. Did you you guys sit down before the writing/recording of this record and decide on a type of sound that you wanted to achieve? Or did you just let it unfold in the studio? Ruess: I had kind of a crazy idea, and I started to write within that idea. From there I brought it up to the guys, and we all kind of thought "oh shoot! It would be crazy if we were able to do this!" It worked out, and so when I started writing the songs, I had a lot of that in mind. Others ones that I had, previously, kind of just adapted and ended up sitting in this whole thing. Are you talking specifically about the sound, or the theme of the lyrics? Ruess: Oh, just the sound. To me it's not conceptual at all. I mean, it might be because I always tend to write what is on my mind and I don't think I progress very far mentally(laughs). It's more of just a general sound and something new that we are trying to do, that I just don't know if that many people have done it. You guys have been in some pretty successful bands over the years. With that in mind, what kind of advice would you have for a band just starting off? Ruess:Yeah, to me it has to do with playing live and just being yourself as much as possible. I think as a songwriter, I want to restrict myself and fall under certain genres or this or that. I try to go with my instincts and not to give myself boundaries. You shouldn't have a lot of boundaries as a songwriter and as a performer, you should just try playing live a lot and try being good at playing live. I think that somehow in this world of pro-tools and the ability to do this and that, live music has been one of those things that has failed the most. I think that it is important to put emphasis on being a good live performer. Speaking of the live performance, who are some people that you have looked up to in the past as far as stage presence/ live performance goes? Ruess: Well, as a kid I was obsessed with At The Drive In. I used to think they put on the craziest shows in the world, and I thought that they were just a really cool band. There is a lot of self-awareness that you have to loose in order to become a great live performer, and they were just so good at feeling the music out and putting on a show without wondering if it was cheesy to be actually moving around. That is something that we all think of too, when we are putting on a show. One time we had a show, at a pretty hip place with a bunch of hip people and I think that we were all worried about the perception.Somehow, moving around and having a good time onstage is not synonomous with being "hip," and we just told ourselves "let's not play to the crowd, let's just be ourselves." It ended up being one of our favorite shows ever. I just always look at someone like Freddy Mercury in those situations, or Mick Jagger. i love a good front man, who doesn't necessarily play an instrument and does a good job of being a master of ceremonies too. On "Aim and Ignite" you listed Beach Boys and Weezer as big influences. What about influences for this new record? Ruess:I think that Beach Boys and Weezer are so inherent to us as musicians, they are always a nice fall back and obviously the new album has a lot of those moments. We tried to just come up with a collection of really good songs that could fit under any type of format. I ended up listening to a lot of Rod Stewart, Elton John and a lot of Kanye West, just channeling a lot of those things, just to me that are inherently good songs despite the production. Ruess: I'm gonna go with a band called The Long Winters. They kind of do it for me as far as summertime is concerned.